Things have been BUSY, so I’m backtracking to July and going to try to “report” as much as I can remember with the help of a few photos we took along the way. We decided one day to visit Wei Wei’s in Toledo based on a friend’s suggestion, who is conveniently a restaurant reviewer. 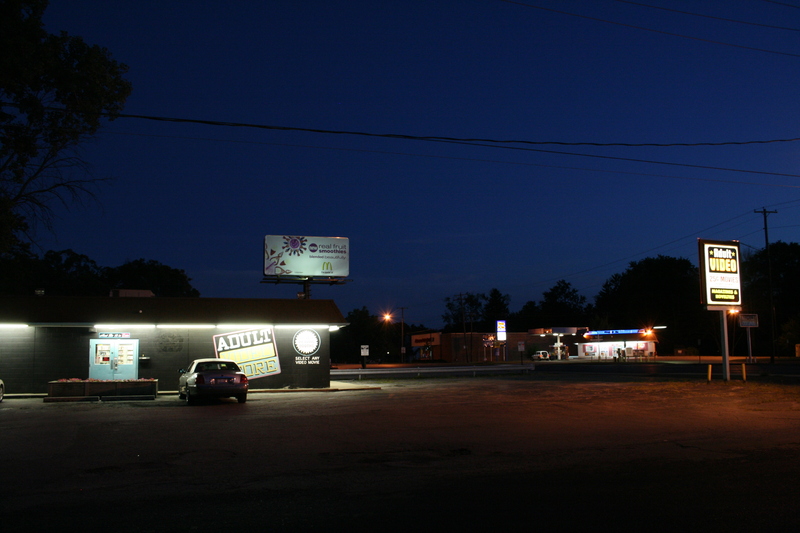 We were pleasantly surprised by the delicious food we tasted in the middle of… Toledo, Ohio. Yeah, Toledo. Not exactly the food mecca of anything, really, but as we drove down the main boulevard looking for Wei Wei’s restaurant among run down gas stations, and boarded up vacant buildings reminiscent of downtown Detroit, Ji Hye and I got distracted at exactly the same time by a donut shop and a row of adult video stores. I’ll let you guess who got distracted at what as we both exclaimed “DONUTS!”/”ADULT VIDEO STORE!”. We were immediately disappointed- again at exactly the same time- that they were both closed and boarded up as we pulled into a parking lot to turn around when we drove past the restaurant. Like we always do, we ordered a variety of dumpling and noodle soup dishes to share and talk about while enjoying. 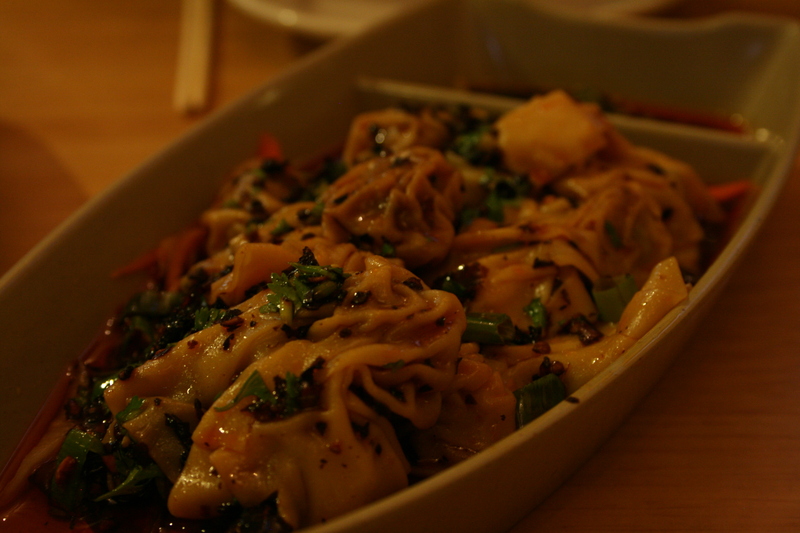 The first dish that came out was a sze-chuan style dumpling/won-ton. These were amazingly good- the skin of the wrapper was the perfect thickness, the filling was tasty and an enjoyable proportion, and most of all the sze-chuan pepper sauce was REALLY good. 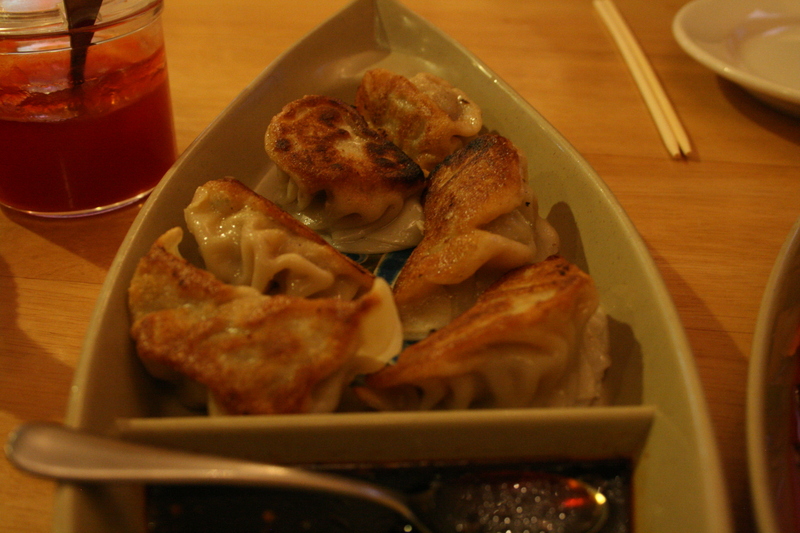 It’s hard to find an all-around good dumpling and THEN have it topped off with an amazing house-made sauce. Next up was the traditional fried potsticker. Also delicious, but just your average, well made dumpling. Nonetheless, we ate the whole dish, and ordered a second. We believe the dumpling sauce (often mistaken for straight up soy-sauce) was also house-made because it too was delicious and had a unique flavor to it. 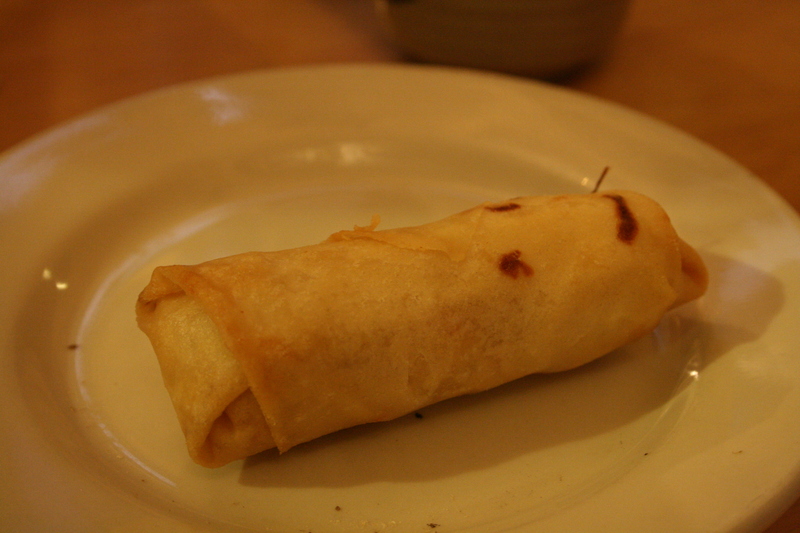 For good measure, we got an order of spring rolls… we were just really hungry. 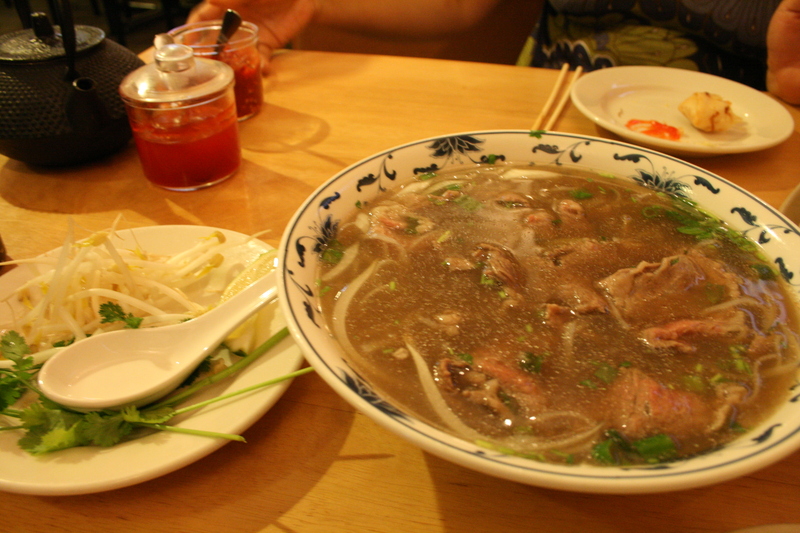 Okay, this Pho was the best pho I’ve had [in America]. I admit I have never been to Vietnam, and doubt that I’ve actually tasted authentic pho, but this was damn good, and we ate every last drop. Usually I opt to get a more Chinese traditional beef noodle soup over pho because the broth tends to have no depth and the meat tastes gamey. This was not the case with this bowl. I’d order 100 of these right now if I could. The meat came out rare, and the heat of the broth cooked it slowly, preserving the tenderness and not over-cooking the meat. The broth was extremely flavorful and spiced well. The raw bean sprouts and cilantro came on the side to continuously add a refreshingly cold crunch to the soup until the end. AWESOME. Better than Viet town in Chicago I must say. I tried unsuccessfully to have the waitress hook us up with the owner/chef to teach us how to make some dumplings, but she just laughed in my face. I asked him a couple times ago, and got a very friendly, polite refusal. He isn’t letting his techniques out. Called Zingerman’s to ask if we could have February’s sandwich of the month held over because we LOVED it and were not able to get back to Ann Arbor in a timely manner because of the bad weather. Told (nicely, of course) “no,” and enough of a reason why that I tracked you to this website. 1) Thanks for introducing us to Wei Wei! It’s very close to us (which is scary on many levels). As you mentioned there is a paucity of good food nearby but we certainly want to support what is available. We hadn’t found it on our own and appreciate your detective work. Let us know of anyplace else! 2) Keep us informed of progress on your endeavors. The sandwich was wonderful and we look forward to trying more. We’ll watch for the food cart at Mark’s carts.